The Name of the currently selected filter. The list of all filters categorized. This is the same set of filters that appear in the Filter menu. They are presented here because often it is useful to apply multiple filters without exiting the dialog. The unique set of control parameters for each filter. Every time a new filter is selected the set of controls can change. If the Preview option is checked a preview of the filter will be shown. Click the Set Preview Area to define a rectangle area to preview the filter on. Click the Clear Preview Area to return to normal preview after using the Set Preview Area. The Apply and Continue button will apply the current filter and keep the dialog box open ready for additional filter applications. The Apply button will apply the current filter and exit the dialog. The Done button will exit the dialog without any further changes. The << Less will reduce the size of the dialog to just the parameter set. This is a list of Presets that you have saved. Clicking on a preset from this list will load the settings. 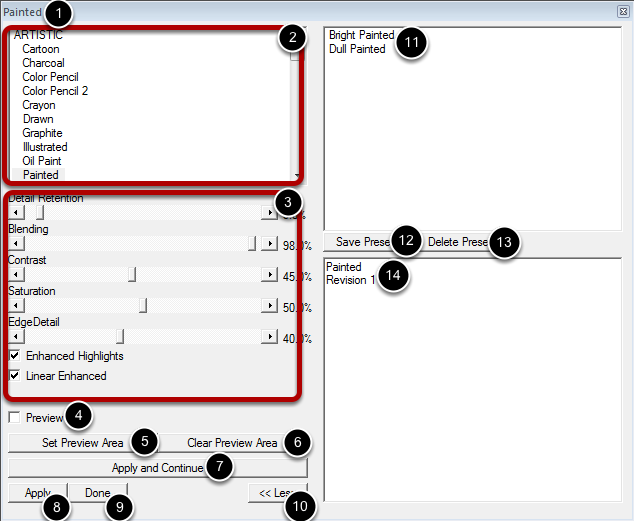 The Save Preset button allows you to name the current set of parameters for later reuse. The Delete Preset will delete the currently selected preset. This area will display information about the filter.